There’s definitely a value to storing solar energy in batteries, and then discharging that energy to meet grid and customer needs. Measuring that value -- and finding a way to share it between battery-equipped solar customers and their utilities -- is a trickier matter. SMUD is using critical peak pricing as its lever. 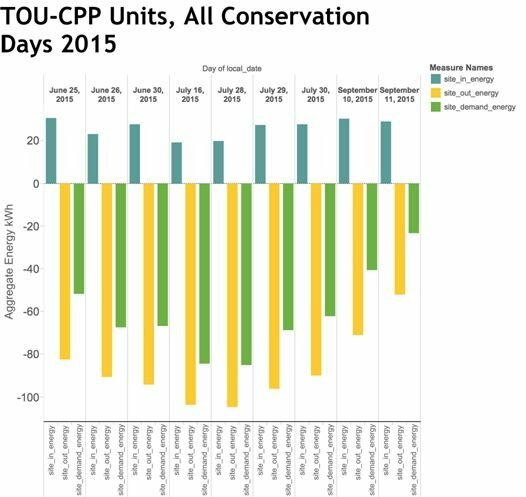 Since 2012, the utility has been running an experiment with residential rate plans that charge extra-high prices during “critical peak period” days, in exchange for extra-low prices at other times. Some customers were offered the option of signing up for the plan -- and others were automatically enrolled. For the past two summer seasons, Sunverge has been making some of its battery-solar home systems available to respond to these critical peak prices, to see how stored solar energy can defer those peaks. Here are some of the results from June through September of this year -- and according to the data, stored solar energy can have a significant role to play. Here are two charts, representing customers on SMUD’s critical peak rates and those who aren’t. 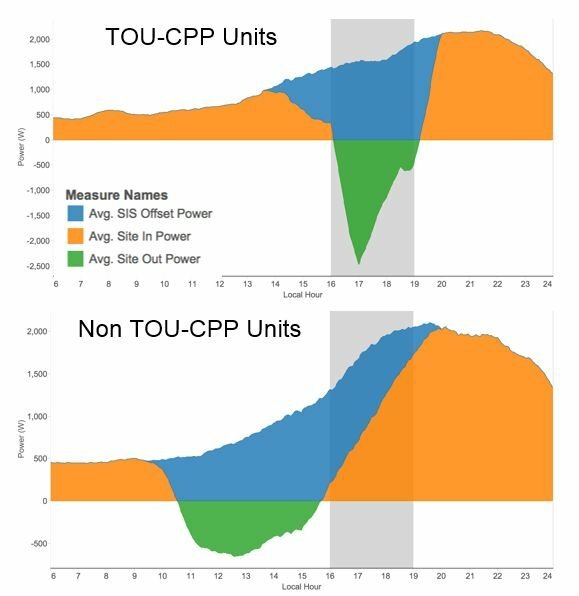 As you can see, peak-pricing-sensitive customers were able to significantly lower their demand profile, and even inject energy into the grid, on nine separate critical peak pricing days. That’s in contrast to homes that aren’t on critical peak pricing, which lacked an incentive to tap their solar batteries. Here's the effect on the homes’ overall demand profile. The top chart shows homes on the CPP rate, and the bottom chart, those without it. The deep-green-colored valley on the top chart indicates battery power being injected back into the home, and on a net basis, back into the grid. 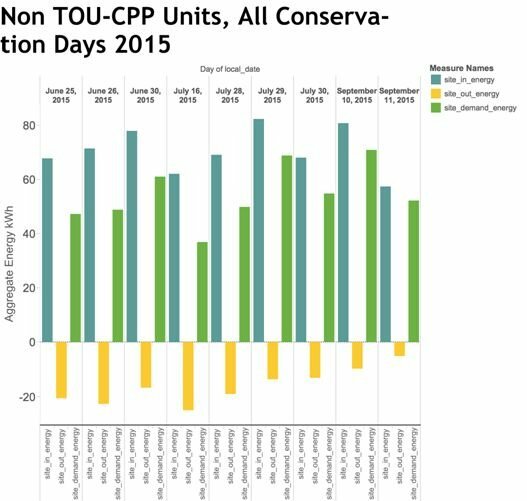 According to Sunverge’s calculations, homeowners on critical peak pricing saved a collective $445 over the course of these nine “conservation days,” compared to what they would have spent without that peak-time contribution from Sunverge’s battery systems. 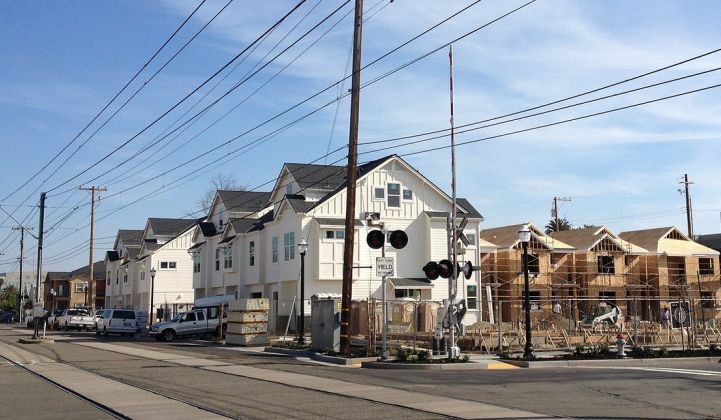 These homes weren’t storing any grid energy, CEO Ken Munson said in a recent interview -- they’re strictly charging from rooftop PV at the home. “There’s more value to unbundle when you get into the very specific nuances of taking these distributed energy resources and optimizing them in concert with the grid,” he said. Sunverge also incorporates smart thermostats, whole-home energy data from utility smart meters, weather forecast data, and a communications platform that taps utility grid data from SCADA and distribution management systems, he noted. This is the same concept pushing so many residential solar companies into partnerships to bring behind-the-meter batteries and home energy control systems to commercial scale. The most well-known is the partnership between Tesla and SolarCity, but we’ve also got Sungevity and Sonnenbatterie, Sunrun and Outback Power, Enphase and Eliiy, Tabuchi Electric and Geli, and SunPower and Sunverge, to name a few.